WhatsApp’s Payments feature has gone live in India for some users on Android and iOS. While not all users will see Payments on their phone yet, the feature is working for us on iOS and Android. WhatsApp is yet to confirm when it roll-out will be complete for all users. The beta testing for Payments has been gone going for sometime now. First, WhatsApp has set an age limit for using Payments. A user will need to be at least 18 years old to use the feature in order to send and receive money on the platform. The company has not yet confirmed how it will confirm the age of the user. Users will need a phone number with the country code for India in order to use Payments. 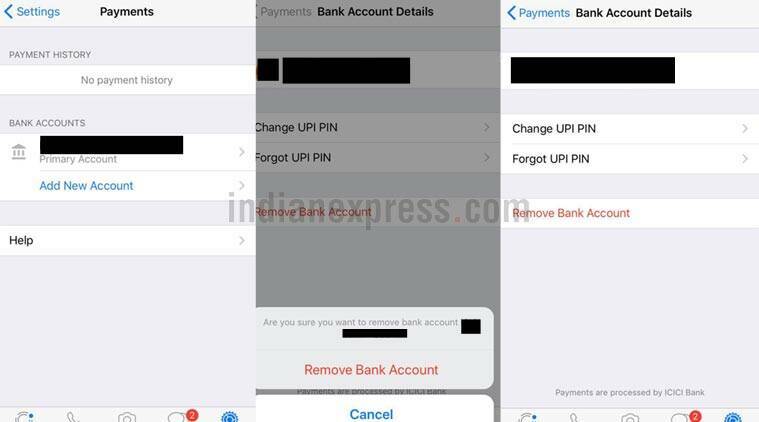 They will also need a bank account, where UPI is supported in order to use the new feature since WhatsApp is relying on this platform for the transactions. Also the phone number, which is being used for WhatsApp has to be same phone number linked to the bank account. Users will need a phone number with the country code for India in order to use Payments on WhatsApp. WhatsApp says the user “must be an owner of the bank account” which is being used to “send and receive funds through Payments.” Once this is confirmed, WhatsApp creates a virtual payment address associated with the WhatsApp account. Users who do not have a UPI Pin for authorising transactions will be asked to create one as well. This UPI Pin is needed to confirm payments. 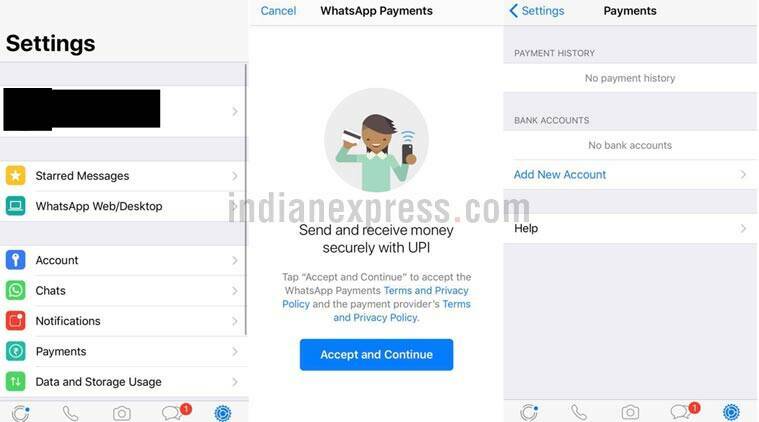 Regarding use of Payments, WhatsApp says user are responsible for payment of the amount and they have to ensure the bank account has sufficient funds before carrying out any transaction through Payments. All payment transactions are final, according to the company. There is no option for refunds or chargebacks. Finally, WhatsApp says Payments should only be used for “legal, authorized, and acceptable purposes,” and that WhatsApp or the Payment Service Provide (PSP) can impose, restrict a user’s ability to carry out transactions if they believe the terms are violated. WhatsApp also says it has no responsibility for any goods or services sold or purchased using the new service. The app confirms it is working with third-party providers and services for Payments and these might give WhatsApp information about Payments transactions in certain circumstances. Examples listed by WhatsApp of the kind of information include information to confirm registration, name, account status, transaction reference IDs, risk or fraud alerts, etc. It goes on to add that some information could be shared with Facebook as well. 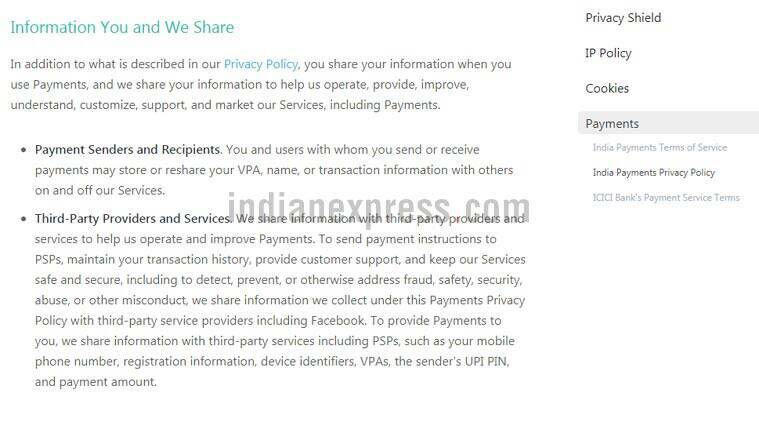 WhatsApp also says that all of this information will be used to help it “operate, provide, improve, understand, customize, support, and market Payments.” Additionally, the PSPs may also collect, use, and share information as set forth in their privacy policies. Finally, it looks like WhatsApp will bring Payments to business account. The terms and conditions say that a Business using their service must comply with all terms of services, including for Payments. It also says that a Business will need to explain all terms, fees to their customers if they are using Payments for carrying out any transactions.